MWS-MT-1 Rangefinder Microwave Slab Tracking Sensor - HiTECH Technologies, Inc. The MWS-MT-1 type Micro-Tracker has been developed for product tracking in the hot line process. The unit consists of a controller, antenna, and reflector. The MWS-MT-1 is an FM － CW method range finder. The MWS-MT-1 emits microwaves towards the reflect object in order to measure the reflection from it. When a slab interrupts the beam between the antenna and the reflect object, the reflection will not be received resulting in the slab presence signal being output. The sensor can be installed either on a diagonal or horizontal axis. Because of the digital detection, this will not be affected by vapor, water running on the slab and/or water spray. Microwaves are unaffected by heat, vapor, flames, or water running on the slab and water spray. When countermeasures to heat are required, use the options above. High reliability The MWS-MT-1 detects the presence or absence of the slab by receiving or not receiving the reflection from the reflector. 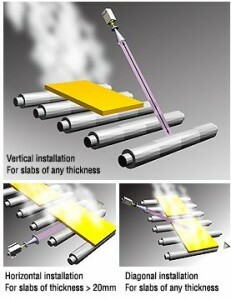 Because of digital detection, this will not be affected by vapor, water running on the slab or water spray. High speed response time 50msec. update time. No beam slippage Beam adjustment is easy because the beam is conical-shaped and there will be no errors caused by slippage of the beam. No set-to-set interference This permits the use of multiple Micro-Trackers in close proximity to each other.